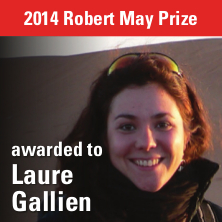 The Robert May Prize is awarded annually for the best paper published in Methods in Ecology and Evolution by an Early Career Researcher. We’re delighted to announce that the 2016 winner is Gabriella Leighton, for her article ‘Just Google it: assessing the use of Google Images to describe geographical variation in visible traits of organisms‘. ‘Just Google it’ marks an important step in converting ecology to an armchair science. Many species (e.g. owls, hawks, bears) are difficult, time-consuming, expensive and even dangerous to observe. It would be a lot easier if we didn’t have to spend time, energy and risk lives having to observe organisms in the field! In her article, Gabriella shows us that the internet can actually save a lot of this effort. She analysed online image data across a range of species: images taken by amateur and professional photographers, if geo-referenced, are potentially excellent sources of information on the phenotypes of species. For instance, data can be obtained this way on distributions of colour morphs or on plumage/pelage patterns. Gabriella compared data collected from Google Images (quick and easy!) with that collected from fieldwork (time-consuming, expensive and dangerous), and showed that the data from google images is perfectly reliable. This is an ingenious and potentially important advance: lots of data are potentially available across multiple taxa, and the possible applications in ecology and evolution are endless. To make the method accessible, the article links to a web application that allows the approach to be widely implemented. Thanks to Gabriella, ecology is going to be cheaper, faster and safer in the future! The article was mainly written up from the results of Gabriella’s BSc Honours project in 2015 at the University of Cape Town, with further effort in some of the case studies explored. She worked closely with her supervisor in honing the method and choosing the case studies from previously published articles to test it, as well as with Pierre Hugo on the design and functionality of the website. Gabriella completed a BSc(Hons) in Biological Sciences at the University of Cape Town in South Africa with co-author Dr Arjun Amar as her supervisor. While the method described in the paper is based on a smaller, exploratory project undertaken the previous year, it was developed and tested further as part of her BSc(Hons) project. She has since undertaken an MSc at the same institution focusing on the urban ecology of a mesocarnivore, the caracal, on the Cape Peninsula. Gabriella currently lives in Cape Town and plans to apply for a PhD once her MSc is complete. You can find out more about the Google Images method that the article describes in ‘Googling for Ecological Answers: Using the Morphic Web Application‘. – Jonathan Lefcheck from the Virginia Institute of Marine Science, for his article ‘piecewiseSEM: Piecewise structural equation modeling in R for ecology, evolution, and systematics‘. The blog post ‘piecewiseSEM: Exploring Nature’s Complexity through Statistics‘ has more information about this article. – Brittany Teller from Utah State University, for her article ‘Linking demography with drivers: climate and competition‘. This article was a part of the ‘Demography Beyond the Population‘ Special Feature in February 2016. The blog post ‘Demography and Big Data‘ has more information about this article. The above 3 articles are included in a free virtual issue, along with all of the winning and highly commended articles from the other four British Ecological Society journals Early Career Researcher Awards. This entry was posted in General, Journal updates, Methods papers, Robert May Prize, Society, top papers, Virtual Issues and tagged Big Data, Brittany Teller, Colour Morphs, Demography, ecology, evolution, Fieldwork, Gabriella Leighton, Google Images, Jonathan Lefcheck, Phenotypes, piecewiseSEM, R, Robert May Prize, University of Cape Town by Chris Grieves. Bookmark the permalink.